The initiative is a public television broadcast and free online instructional program called The Burt Road Show. It's tag line is: "where preschoolers learn to read and others learn to read better." 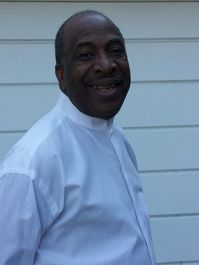 Pastor Hogan is a retired educator and longtime vocal advocate for preschool literacy. He pastors Emmanuel/PCL Church of God in Christ Located in the Detroit subdivision of Brightmoor. The first 34 episodes of The Burt Road Show targets preschoolers. The objective is to teach even at-risk preschoolers to recognize the letters of the alphabet and their corresponding sounds and to experience what it feels like to read fluently and with excellent comprehension - all before entering kindergarten. The program is designed to teach three-to-five year-olds to read three books containing 340 words running and to instantly recognize over 250 key words; all while having more fun than playing in the sand. Pastor Hogan believes even at-risk preschoolers deserve an exciting, successful, fun-filled learning-to-read experience. He believes it should be as exciting for teachers, parents, friends and extended family as when children learned to walk and talk. University studies revealed that prescoolers watch TV and other mobile video devices on average of 4.5 to 6 hours everyday. And after 45 years of entertainment-rich early-learning TV programs, producers have failed to maximize the educational benefits television and other mobile viewing devices could and should provide for at-risk preschoolers. Mr. Hogan believes that The Burt Road Show will change all of that.